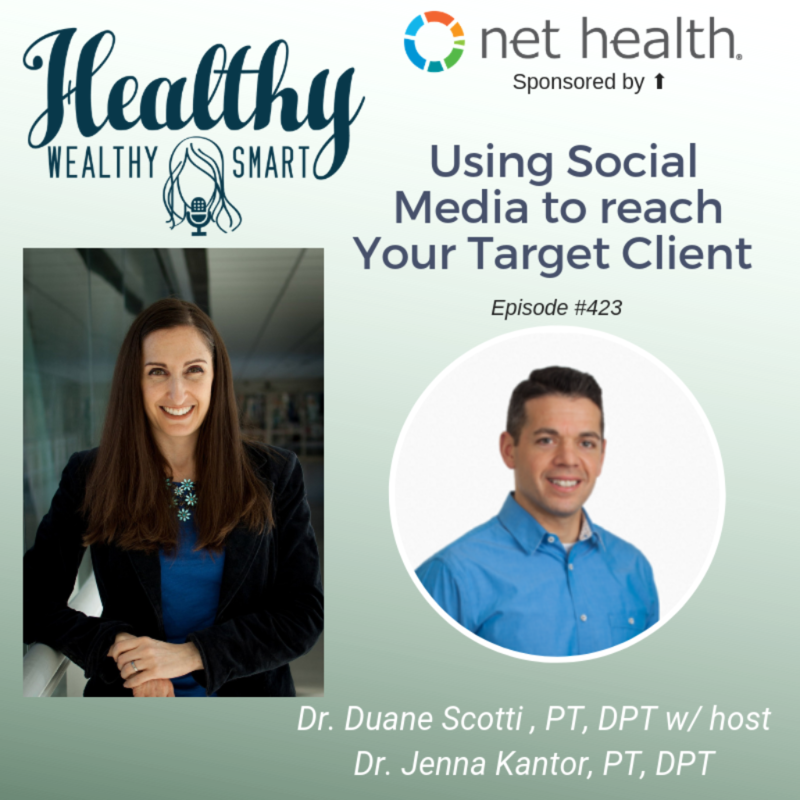 On this episode of the Healthy Wealthy and Smart Podcast, Jenna Kantor guest hosts and interviews Duane Scotti on social media marketing. Dr. Duane Scotti is a physical therapist, educator, researcher and founder of Spark Physical Therapy. He is considered a leader in the fields of rehab, sports medicine, performing arts medicine, and human performance optimization. With years of experience as a physical therapist, runner, and dance instructor in combination with his strength and conditioning background, Duane has been working with many patients to improve all aspects of human performance. Dr. Duane Scotti is a physical therapist, educator, researcher and founder of Spark Physical Therapy. He is considered a leader in the fields of rehab, sports medicine, performing arts medicine, and human performance optimization. With years of experience as a physical therapist, runner, and dance instructor in combination with his strength and conditioning background, Duane has been working with many patients to improve all aspects of human performance. Duane is currently the founder of Spark Physical Therapy, providing prehab, rehab, and performance optimization services either onsite or in the comfort of your home within the Cheshire/Wallingford CT region. He also is a clinical assistant professor in the Department of Physical Therapy at Quinnipiac University responsible for coordinating and teaching musculoskeletal examination, intervention, and advanced manual therapy within the orthopedic curriculum. Duane received his Bachelor of Health Science degree and Master of Physical Therapy degree from Quinnipiac University in 2001 and 2003. He then went on to receive a clinical Doctor of Physical Therapy and a Ph.D. in Physical Therapy from Nova Southeastern University in 2017. Duane is a board-certified Orthopaedic Clinical Specialist, Certified Mulligan Practitioner, certified in dry needling and has advanced training in spinal manipulation, dance medicine, gymnastics medicine, and rehabilitation for runners. Duane has been in clinical practice working with orthopedic, sports, and performing arts populations since 2003. He has strong clinical and research agendas in screening, injury prevention, and rehabilitation for runners, dancers, and gymnasts. Duane uses an integrative model of manual therapy including manipulation, mobilization, and soft tissue treatment including dry needling and the Graston technique for the management of musculoskeletal dysfunction. 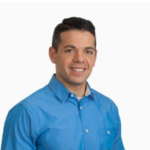 Duane is a physical therapy advocate and is actively engaged with the American Physical Therapy Association and serves as Vice President of the Connecticut Physical Therapy Association. Jenna Kantor: 00:00 Hello, this is Janet Kantor with Duane Scotti, a physical therapist from Connecticut who is joining me today on healthy, wealthy and smart. And today we’re talking about doing a specific niche on social media and really just nailing it. You are nailing it, Duane. So first of all, thank you so much for coming on. Duane Scotti: 00:19 Thank you for having me. This is awesome. I’m very happy to be able to talk to you about this topic today. Jenna Kantor: 00:26 Yes. So I would love to know first, how did you choose what social media platform you were going to put most energy on or also I’ve seen you on Instagram, but you may also be on other platforms and I would just love for you to expand on that. Duane Scotti: 00:41 Great question. When I was looking into kind of getting into social media and using it as a platform, I thought about what is my audience, right? So most of the patients that I treat are adolescents, so I basically treat gymnast runners and dancers and a lot of them are on Instagram. So I started the Instagram account and started learning everything I could learn about Instagram, but their parents are on Facebook. So a lot of, you know, their parents are on Facebook and there’s different groups on Facebook. So that’s been beneficial from that standpoint. So those are really the two platforms that I utilize. I do have a Twitter but I haven’t used it. Primarily because that’s more for professional and other PT’s and that’s not really my target audience. Jenna Kantor: 01:27 Right, right. Absolutely. I like how you hit the nail on the head regarding Twitter specifically, I’m not as active myself. I have something set up where it automatically posts, but my heart isn’t there because that’s like you said, not where my target audience is. And I like how you bring that up. So how does your content differ from Facebook where the parents are, to Instagram, where the kids are? Duane Scotti: 01:52 There’s not too much differences in terms of I do post the same content basically to both platforms. The messaging is a little different if I’m sharing it to a group. So specifically at our local dance studio, we have a closed group so my messaging is going to be a little bit different, kind of targeting the parents and looking out for their dancer, as well as the stories on Instagram. So the stories are on Instagram are a little different, but the content posts that I do on a daily basis, they are going to be the same post that just instantly goes over to Facebook and I’ll shoot it over there from Instagram. Jenna Kantor: 02:27 And you just mentioned a little bit about you have kids who are going to these dance schools. There’s a relationship you already have with these parents that’s helping you build these groups. Would you mind elaborating a little bit more on how that came about? Jenna Kantor: 02:49 Shout out to your kids. Duane Scotti: 02:51 So they are at the local gym, the local dance studio that I’ve been affiliated with awhile. I also taught at the local studio, I was a dance instructor there. And you know, obviously those relationships, the families, they kind of have known me and trusted me for years and I’ve helped out their dancers before. So those are kind of how those relationships have been built. It’s really more of me just being present and being there for, you know, picture day and you know, I’m there doing, you know, kind of complimentary screenings and things of that sort. So you kind of develop that rapport and relationship with the families where you kind of earn their trust, that you’re going to be kind of looking out for their dancer. Jenna Kantor: 03:34 You know, you hit upon something that I think is so valuable. 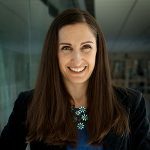 I actually interviewed Karen Litzy the other day for her own podcast, this podcast in which we are interviewing for right now. And she was talking about these relationships and how she just lives her life and through the things that she’s already passionate about. She’s made these relationships and help those relationships grow. And it sounds like that’s what you have hit upon, which you agree. Duane Scotti: 04:01 Absolutely. Absolutely. Relationships are everything and from a practitioner standpoint, your relationship with your patient and their families are important. But then expanding beyond that and you know, things are a lot different than the healthcare world. And when I first graduated, you know, it was prior to direct access time and everything was about trying to foster that relationship with your referring physician. Now it’s a completely different animal. You know, my relationships I’m fostering with are the communities in which I serve. So looking at the gymnastics community or it’s the relationship with the coaches, right? And having, you know, I’m just thinking about the first facility that I started in, it was talks with coaches, not just one saying, Oh yeah, I’m a physical therapist, let me treat your gymnast. But it was many talks, many conversations you developed that rapport, that relationship, and then that turns into, hey, can you help this gymnast out? Duane Scotti: 04:56 Oh we have another one. Can you help this one out? And then you kind of foster that relationship over time and then you wind up seeing, you know, your practice or your business kind of growing from that standpoint. And it’s really kind of getting into our communities and for me at least that has been successful is having those relationships with, you know, the dance studio owners, the gym owners, now we’re treating out of an aerial silk studio. So really you develop that relationship and then they recommend your services to people that are in their circle, right. And their business because they trust you. So I think those relationships are definitely, definitely important for kind of long term success. Jenna Kantor: 05:38 Yeah. And it just makes it more enjoyable because you honestly enjoy each other and so I think that’s great. So let’s go back to the social media stuff. Your content itself, I mean, I’ve seen the video of you dancing with your daughter, which was great. What was it? The diggy? Duane Scotti: 05:53 That was the Kiki challenge. Jenna Kantor: 05:56 I think that video pretty much went viral. Am I correct? Duane Scotti: 06:00 Yeah. That one was definitely my best performing video. So yeah, it was fun. That was something that, you know, a lot of people were doing that. And I think you saw on the news like a dentist had done it. I was like, you know what, we should do this as a physical therapist and just showcase what physical therapists do. So, you know, my daughter’s a dancer and she was interested. I said, Gabby, let’s do it and let’s do a little dance. So we just kind of put it together real quick and that was fun. And that’s the thing I do like about social media. It’s really nice. You can have fun with it. We are professionals and we always have professional interactions with our patients, but we also have fun with them. Duane Scotti: 06:37 Right. And we’re human, we’re people. So just kind of showing some of that human side I think has been definitely beneficial. And you know, if you look at your insights on, you know, Facebook or Instagram, the posts that do the best are the ones where I am not trying to be super serious and I’m not showing the best technique and the best tool in my toolbox that I know it’s more of me just being genuine and it’s more of you know, doing a silly dance or you know a picture with the family or you know, something that’s kind of outside the box. Jenna Kantor: 07:14 It lets people feel more connected to you. So let’s go into more on Instagram because Instagram unlike Facebook, Facebook you can schedule posts for free, Instagram you can’t right? So are you using one of those paid for platforms to post or do you just post daily and what is your schedule that you abide by to be consistent? Duane Scotti: 07:40 Well, you hit a really important point is that consistency is key with Instagram and Facebook. It is one of those things and it’s just like anything we do in life habit, right? Exercise goals, running goals, wherever it is. Getting to the gym, you gotta be consistent and I don’t know, people for different things what like two or three weeks to form a habit and then it becomes a habit. And for me that’s been helpful where now it’s just part of my daily routine and scheduling it in advance and doing batching and kind of putting videos together, putting, you know, writing, you know, batching all your posts together. It’s definitely helpful. It makes it easier. But unfortunately Instagram does not have, like you said, where you can schedule out your posts, so you do need to post it. Then I have heard of other platforms that you can utilize to put your posts in, but it still will send you a reminder to your phone saying this post is ready to go. And then you’d have to open Instagram and actually post it. So that is the limitation in terms of time management. So it is “work” where you need to think about it. Hey, I have to post on this day. I’ve thought about and you know, and maybe in the future trying to delegate a bit of that out, just to ease a little of the burden of having to do that. And I actually trialed that shout out to Nikki when I was on vacation. Jenna Kantor: 09:04 Hi Nikki. I don’t know who you are, but thank you. Duane Scotti: 09:07 She did an awesome job and I wrote all the posts in advance and she did the posting for me when I was out of the country and I couldn’t post. So I think it’s a doable model, but you still needed to write the post. And because I think, again, going back to being human and genuine, right? So a lot of these bigger businesses, you know, they have marketing people who are doing their posts, but you can tell it’s more from a marketing angle and standpoint. It’s not that person being genuine and who they are. Jenna Kantor: 09:34 That was so eloquently said. I don’t know if we’d go out for coffee, but good, good job. Duane Scotti: 09:41 Right, right. So that is, you know, on Facebook they do have the scheduling, but if you’re going to wind up forcing an Instagram, again, like I said, you can just shoot it over to Facebook then. So yeah, I unfortunately don’t have a scheduling system that will just like send them all out. Which would be nice. Jenna Kantor: 09:58 And then for the content preparation, do you pretty much do like on Sunday you prepare for the week or do you kind of do daily? Do you have a system for that yet or how do you do that? Duane Scotti: 10:10 Sure. I don’t do that specifically on Sundays, but on Sundays I do iron all my outfits for the week. Jenna Kantor: 10:15 You buy clothes that you need to iron? That’s lesson number one. You’re supposed to buy shirts that are iron free, like you don’t need an iron. So let’s start there. Now move onto the creating of content. Duane Scotti: 10:33 Yeah. So it’s really whenever I have free time, so there’s no specific day where I’m like, okay, Sunday is the day that I’m going to do all that. It’s whenever I have a chunk of time, then I have a calendar. I have a plan for what’s going to be coming out when and then it’s a matter of all right, I’m going to do these videos, whether I’m going to write some captions in the videos from adding music, whatever the case may be. And then I have all those ready to go. So that’s like my videos ready to post folder on my phone there. And then I will have the write ups. So then whenever I have free time it’s like, okay, let’s write up this post that post that post. And so then it’s kind of done in advance. Ideal world is I would have like a full week’s worth of content and I found that is so much better because it’s not stressful thinking about because your day is busy, right? Duane Scotti: 11:17 So I teach during the day, you know, doing the practice in the evenings and on the weekends. And you know, if I get to the point where it’s, oh, I don’t have a post today, it’s stressful and then you have the pressure of coming up with something right on the spot. And so having it in advance, it’s a lot easier where it’s ready to go, the writing is done, the post is actually done, the videos are done and then it’s a matter of just literally opening up the platform and hitting the plus button and there’s your video and copy paste, boom, boom, boom and then you’re off and running. Jenna Kantor: 11:48 Yeah. And you’re hitting upon why I’m actually considering investing in an Instagram, a paid for platform to post for Instagram because this is where the value of being able to schedule it out really comes in because you could schedule it out for a year. I mean, imagine that you just hammer it out, you know, you’re like, I love you children. You go play, you get to watch movies this whole weekend while I create content. And then you pull them in, you say, hey, you know what, I would like you to create choreography to five songs. So then you could do the family thing a couple times. But yeah, I think that is a key thing to maybe even tap on. I’m actually brainstorming for myself, not even giving you advice because for me, Instagram personally is a platform that I’m just about to start going for. I took the time with Facebook first, I’m very on top of that and now Instagram is my next target to like create those habits. So it’s really good for me as a practitioner to hear what you’re doing, what your experience is and how possible it is, so thank you. Duane Scotti: 12:58 Yeah, I know. And on Instagram, you know, it is a little different from Facebook in that I feel like you need to write a little less. And attention spans are a little different on Instagram. So, you know, those things are different and obviously the hashtags are important on Instagram, whereas Facebook, they’re not. So you know, knowing which, you know, tags to use can help bring your reach to a wider audience and kind of your target audience. So you do have to give some thought to the actual tags that you are going to use on Instagram, which I think helps, you know, get your stuff seen. Jenna Kantor: 13:35 Yeah. How did you find the Hashtags for you? Because you could sit there and say Hashtag dance and see that a lot of people post dance, but if you’re going to really target the people in your area, how did you get those hashtags? Duane Scotti: 13:48 So I do some local hashtags. I’m still looking at towns, right. So Wallingford, Connecticut, Cheshire, Connecticut, North Haven, Connecticut and we’ll look at those local tags. And I don’t know if anyone really truly knows the answer to the algorithm. But it is, you know, do you go with the hashtags that have the most numbers or because there’s so many things posted on them anyway your stuff’s never going to be seen. Or do you go with some that aren’t in the millions or the hundreds of thousands so you can get into your niche, right? So I try to make them relevant to whatever the post is and then relevant to my target audience and you know, looking at if it is something on the ankle and ankle pain or maybe you’re someone searching for that or ankle sprain I use those tags. Jenna Kantor: 14:38 Yeah. That’s great. Well, thank you so much and my last question would be do you consider yourself an expert on social media? Jenna Kantor: That is where I think it’s perfect to end for all you practitioners. We have worked so hard to get our licenses to work on these patients in physical therapy or honestly in any health career that you are pursuing. You don’t need to be an expert. You just need to start. And the more you do, the more curious you get and the more you will learn. And Duane Scotti here is definitely a perfect example of that. So thank you so much for coming on this podcast and sharing your knowledge. Duane Scotti: Yes, thank you so much for having me.